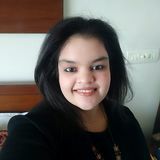 ACKNOWLEDGEMENT oI, Anvi Mathur of UG -PD:2015 -19 would like to thank our course leader Pranay Mangrati and module tutor Srishti Bajaj for guiding and supporting us through this module. oI, would also like to acknowledge friends ,family and the labour who helped me throughout the process of the project. oAt last I would like to acknowledge all the organisations that allowed us to visit and provided us with all the information. PROJECT BRIEF To design a “Tangible product” for a user with special needs. The product should be contextually designed keeping in mind the environment. This is not a special category only catering to people with special needs. The aim is to make people with special needs not to feel alienated, minority or distinguishable. This is a fundamental condition of good design. If an environment is accessible, usable, convenient and a pleasure to use, everyone benefits. 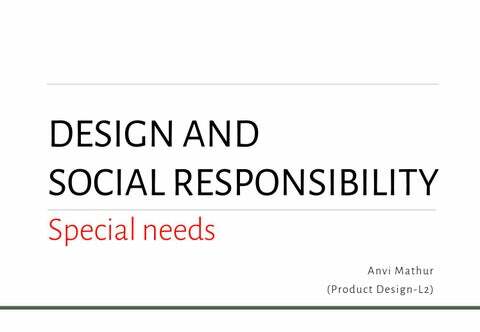 By considering the diverse needs and abilities of all throughout the design process, inclusive design/universal design creates products, services and environments that meet people’s needs. Simply put, universal design is good design. WHAT ARE SPECIAL NEEDS? Any kind of difficulties (such as a physical, mental, emotional, behavioural, or learning disability or impairment) that causes an individual to require additional or specialized services or accommodations (such as in education or recreation) are known as special needs. An individual with special needs may need help in one or more of the following areas: oCommunication oMovement oSelf-care oDecision-making A â&#x20AC;&#x2DC;Learning Difficultyâ&#x20AC;&#x2122; is where a child: Has significantly greater difficulty in learning than the majority of children of the same age. Has a disability which prevents or hinders them from making use of the educational facilities of a kind generally provided for children of the same age in schools; or under compulsory school age and falls within the definition above or would do so if special education provision was not made for them. ISSUES RELATED TO SPECIAL NEEDS MEDICAL ISSUES oMedical issues for children include serious conditions like cancer and heart defects, muscular dystrophy and cystic fibrosis. It also includes chronic conditions like asthma and diabetes; congenital conditions like cerebral palsy and dwarfism; and health threats like food allergies and obesity. oChildren with medical issues may require numerous tests, long hospital stays, expensive equipment, and accommodations for disabilities. Your family may have to deal with frequent crises, uncertainty, and worry. In any case, establishing a good support system is very important. BEHAVORIAL ISSUES oChildren with behaviour issues may not respond to traditional discipline. Diagnoses like ADHD, fetal alcohol spectrum disorder (FASD), dysfunction of sensory integration, and Tourette's syndrome require specialized strategies that are tailored to their specific needs. oIf these strategies are not developed and used, kids with behaviour issues can throw their families into chaos. It also increases the risk for problems at school. As a parent, you will need to be flexible, creative, and patient. LEARNING ISSUES oChildren with learning disabilities like dyslexia and auditory processing disorder (APD) struggle with schoolwork regardless of their intellectual abilities. They require specialized learning strategies to meet their potential and avoid self-esteem problems and behavioural difficulties. oParents of learning-challenged kids need to be persistent. This includes working with your child at home as well as teachers and schools to ensure they get all the help they need. MENTAL HEALTH ISSUES Realizing that your child suffers from anxiety or depression or has attachment difficulties can be unexpected. Again, every child will be different, yet these can leave your family dealing with a roller coaster of mood swings, crises, and defiance. It's important that parents find the right professionals to help. You will also need to make decisions about therapy, medications, and, possibly, hospitalization. The consequences of missed clues and wrong guesses can be significant. ADHD Attention-deficit hyperactivity disorder is a biological condition that makes it hard for many children to sit still and concentrate. ADHD is a cluster of difficulties that involve the self management system of the brain. There are various areas of the brain that control your child’s ability to concentrate and “hit the brakes.” These areas may be less active and develop more slowly in kids with ADHD. The best evidence for this occurs in the front part of our brain, or the frontal lobe. This can upset the balance of certain brain chemicals. It can also explain why your child may have more trouble socially than his peers. TYPES OF ADHD: oADHD, Predominantly Hyperactive-Impulsive Presentation: Kids who have this type of ADHD have symptoms of hyperactivity and feel the need to move constantly. They also struggle with impulse control. oADHD, Predominantly Inattentive Presentation: Kids who have this type of ADHD have difficulty paying attention. They’re easily distracted but don’t have issues with impulsivity or hyperactivity. This is sometimes referred to as attention-deficit disorder (or ADD). oADHD, Combined Presentation: This is the most common type of ADHD. Kids who have it show all of the symptoms described above. VISUAL IMPAIRMENT A vision impairment refers to when you lose part or all of your ability to see (vision). The World Health Organization (WHO) classifies visual impairment based on two factors: the visual acuity, or the clarity of vision, and the visual fields, the area from which you are able to perceive visual information, while your eyes are in a stationary position and you are looking straight at an object. Three Types of Vision Impairments oLow visual acuity, also known as moderate visual impairment, is a visual acuity between 20/70 and 20/400 with your best corrected vision, or a visual field of no more than 20 degrees. oBlindness is a visual acuity of 20/400 or worse with your best corrected vision, or a visual field of no more than 10 degrees. Autism Autism spectrum disorders (ASD) are characterized by social-interaction difficulties, communication challenges and a tendency to engage in repetitive behaviours. Basic symptoms of autism are often accompanied by other medical conditions and challenges. The children are born apparently normal, but then begin to deteriorate by the age of 1 to 2 years. The main features start appearing before 36 months of age. These children may have some speech developmental and social interactive regression, usually around 18 months of age. The Diagnosis of childhood autism must meet the specific DSM IV criteria and will therefore present with poor eye contact, pervasive ignoring, language delay, and other features. Per definition, these children will have a severe impairment in speech, communication, or social interaction. Many of them will be completely non-verbal and “in their own world.” ASD now includes various conditions as listed: • Autistic disorder (classic autism). • Asperger’s disorder (Asperger syndrome). • Pervasive developmental disorder not otherwise specified (PDDNOS). • Childhood disintegrative disorder (CDD). CAUSES OF AUTISM The causes seem related to genetic predisposition triggered by pollution affecting the mother (high contamination found in breast milk) or the child after birth through air / food / water / insecticides / pesticides / heavy metal exposure in drugs and daily use chemicals and household goods. According to Dr. Allam, Institute of Child Development, the radiations from the IT sector are also a major cause of autism. The maximum number of autistic people are in Bangalore within India and in America around the world since these are the IT hubs. By contrast, most children who develop autism have difficulty engaging in the give-and-take of everyday human interactions. By toddlerhood, many children with autism have difficulty playing social games, don’t imitate the actions of others and prefer to play alone. They may fail to seek comfort or respond to parents' displays of anger or affection in typical ways. oPeople with autism have difficulty in regulating emotions. This can take the form of seemingly “immature” behaviour such as crying or having outbursts in inappropriate situations. It can also lead to disruptive and physically aggressive behaviour. The tendency to “lose control” may be particularly pronounced in unfamiliar, overwhelming or frustrating situations. Frustration can also result in self-injurious behaviours such as head banging, hair pulling or self-biting. COMMUNICATION CHALLENGES By contrast, young children with autism tend to be delayed in babbling and speaking and learning to use gestures. Some infants who later develop autism coo and babble during the first few months of life before losing these communicative behaviours. Others experience significant language delays and don’t begin to speak until much later. With therapy, however, most people with autism do learn to use spoken language and all can learn to communicate. Many nonverbal or nearly nonverbal children and adults learn to use communication systems such as pictures (image at left), sign language, electronic word processors or even speech-generating devices. oSome have difficulty combining words into meaningful sentences. They may speak only single words or repeat the same phrase over and over. Some go through a stage where they repeat what they hear verbatim (echolalia). o Some children and adults with autism tend to carry on monologues on a favourite subject, giving others little chance to comment. In other words, the ordinary “give and take” of conversation proves difficult. o inability to understand body language, tone of voice and expressions that aren’t meant to be taken literally. For example, even an adult with autism might interpret a sarcastic “Oh, that's just great!” as meaning it really is great. oConversely, someone affected by autism may not exhibit typical body language. Facial expressions, movements and gestures may not match what they are saying. Their tone of voice may fail to reflect their feelings. Some use a high-pitched sing-song or a flat, robot-like voice. This can make it difficult for others know what they want and need. This failed communication, in turn, can lead to frustration and inappropriate behaviour (such as screaming or grabbing) on the part of the person with autism. REPETITIVE BEHAVIOURS oCommon repetitive behaviours include i. Repeating sounds, words, or phrases. Sometimes the repetitive behaviour is self-stimulating, such as wiggling fingers in front of the eyes. oThe tendency to engage in a restricted range of activities can be seen in the way that many children with autism play with toys. Some spend hours lining up toys in a specific way instead of using them for pretend play. Similarly, some adults are preoccupied with having household or other objects in a fixed order or place. It can prove extremely upsetting if someone or something disrupts the order. oRepetitive behaviours can take the form of intense preoccupations, or obsessions. These extreme interests can prove all the more unusual for their content (e.g. fans, vacuum cleaners or toilets) or depth of knowledge (e.g. knowing and repeating astonishingly detailed information about Thomas the Tank Engine or astronomy). Older children and adults with autism may develop tremendous interest in numbers, symbols, dates or science topics. DIAGNOSIS o Autism spectrum disorder (ASD) diagnosis is often a two-stage process: i. The first stage involves general developmental Screening during well-child check-ups with a paediatrician. The second stage involves a thorough Comprehensive diagnostic evaluation by a team of doctors . o Children with autism spectrum disorder Autism spectrum disorder (ASD) can usually be reliably diagnosed by age 2. Early intervention can reduce or prevent the more severe disabilities associated with Autism spectrum disorder (ASD). Early intervention may also improve your childâ&#x20AC;&#x2122;s language, communication and everyday functional skills. PREVELANCE OF AUTISM o The CDC survey found that around 1 in 110 children has Autism spectrum disorder (ASD). Boys face about four to five times higher risk than girls. oEstimated prevalence 1.12 [INCLEN study, unpublished data]. oThe incidence of Autism spectrum disorder in males 1:42 whereas in females it about 1:189. oThis makes that every 1 in 68 children is diagnosed with Autism spectrum disorder. oRepeating words or phrases that they hear, a behaviour called echolalia. oUsing words that seem odd, out of place, or have a special meaning known only to those familiar with that person’s way of communicating. oHaving facial expressions, movements, and gestures that do not match with what is being said oHaving an unusual tone of voice that may sound sing-song or flat and robot-like oHaving trouble understanding another person’s point of view or being unable to predict or understand other people’s action. Children with ASD may have other problems, such as being very sensitive to light, noise, clothing or temperature. They may also experience sleep problems, digestion problems and irritability. CONDITIONS ASSOCIATED TO ASD oSensory problems : Many children with ASD either overreact or under react to certain sights, sounds, smells, textures, and tastes. For example, some may: i. Experience pain from certain sounds, like a vacuum cleaner, a ringing telephone, or a sudden storm; sometimes they will cover their ears and scream. oSleep problems : Children with ASD tend to have problems falling asleep or staying asleep, or have other sleep problems. These problems make it harder for them to pay attention, reduce their ability to function, and lead to poor behaviour. oIntellectual disability : Many children with ASD have some degree of intellectual disability. When tested, some areas of ability may be normal, while othersâ&#x20AC;&#x201D;especially cognitive (thinking) and language abilitiesâ&#x20AC;&#x201D;may be relatively weak. oSeizures : One out of four children with ASD have seizures, often starting either in early childhood or during the teen years. Sometimes lack of sleep or high fever can trigger a seizure. oFragile X syndrome : Fragile X syndrome is a genetic disorder and is the most common form of inheritance. An Intellectual disability, causing symptoms similar to ASD. Since this disorder is inherited, children with ASD should be checked for Fragile X, especially if the parents want to have more children. oTuberous sclerosis : Tuberous sclerosis is a rare genetic disorder that causes noncancerous tumours to grow in the brain and other vital organs. Tuberous sclerosis occurs in 1 to 4% of people with ASD. oGastrointestinal problems : Some parents of children with ASD report that their child has frequent gastrointestinal (GI) or digestion problems, including stomach pain, diarrhoea, constipation, acid reflux, vomiting, or bloating. oCo-occurring mental disorders: Children with ASD can also develop mental disorders such as anxiety disorders, Attention Deficit Hyperactivity Disorder (ADHD), or depression. STRENGTHS AND ABILITIES oHaving above average intelligence. According to the CDC reports, 46% of ASD children have above average intelligence oBeing able to learn things in detail and remember information for long period of time oBeing strong visual or auditory learners oExcelling in math, science, music, game, art, computers. Level 1: “Requiring Support”- MILD A person who is able to speak in full sentences and engages in communication but whose to-and-fro conversation with others fails, and whose attempts to make friends are odd and typically unsuccessful. Inflexibility of behaviour causes significant interference with functioning in one or more contexts. Difficulty switching between activities. Problems of organization and planning hamper independence. Level 2: “Requiring Substantial Support”MODERATE A person who speaks in simple sentences, whose interaction is limited to narrow special interests, and who has markedly odd nonverbal communication. Inflexibility of behaviour, difficulty coping with change, or other restricted/repetitive behaviours appear frequently enough to be obvious to the casual observer and interfere with functioning in a variety of contexts. Distress and/or difficulty changing focus or action. Level 3: “Requiring Very Substantial Support”- SEVERE A person with few words of intelligible speech who rarely initiates interaction and, when he or she does, makes unusual approaches to meet needs only and responds to only very direct social approaches. Inflexibility of behaviour, extreme difficulty coping with change, or other restricted/repetitive behaviours markedly interfere with functioning in all spheres. Great distress/difficulty changing focus or action. VERBAL THERAPY Verbal (speech and language) therapists observe, analyse, interpret and treat problems of speech, language, voice, communication and auditory processing when the disorder is a consequence of cerebral palsy, hypoxic brain injury or autism. The therapy focuses on improving the patient’s speech, articulation, swallowing or communication with or without alternative methods. The program includes exercises to : oEnhance oral muscles, oImprove feeding and swallowing issues including problems with gathering food and sucking, chewing, or swallowing food. oEstablish speech and language skills oTypically includes the development and improvement of communication skills. Helps to enhance social adaptation of the individual in regard to communication. A speech therapist works with the child on the receptive (understanding) part of speech and language as well as the expressive part (talking). Speech therapists help improve the child’s ability to speak clearly or communicate using alternative means of communication or sign language. Speech interventions often use a child’s family members and friends to reinforce the lessons learned in a therapeutic setting. This kind of indirect therapy encourages people who are in close daily contact with the child to use their new skills in conversation, learning and play. APPLIED BEHAVIOUR ANALYSIS (ABA) ABA uses the scientific principles of learning and motivation in order to effectively teach. It focuses on the idea that the consequences of what we do affect what we learn and what we will do in the future. ABA seeks to improve specific behaviours while demonstrating a reliable relationship between the procedures used and the change in the individualâ&#x20AC;&#x2122;s behaviour. ABA uses positive reinforcement to increase more positive behaviours and social interactions and decrease inappropriate behaviours. ABA therapy is customized to an individualâ&#x20AC;&#x2122;s unique needs. oActivities of daily living (ADLs), also known as self-help skills, such as brushing teeth, dressing and toilet training; visual-perceptual skills; handwriting etc. MUSIC THERAPY Music Therapy is the clinical and evidence-based use of music interventions to accomplish individualized goals within a therapeutic relationship by a credentialed professional who has completed an approved music therapy program. Music Therapy is used to address physical, emotional, cognitive, and social needs of individuals. After assessing the strengths and needs of each child, the music Ability to alter therapist provides the indicated treatment including creating, singing, moving to, Improve your state and/or listening to music. Through musical involvement in the therapeutic of mind context, childâ&#x20AC;&#x2122;s' abilities are strengthened. Music therapy also provides avenues for Reduce the communication that can be helpful to perception of those who find it difficult to express pain themselves in words. RELATIONSHIP DEVELOPMENT INTERVENTION (RDI) RDI training is a therapy for autism spectrum disorder which is most effective when children start getting therapy at a young age, but it can be beneficial for people of all ages. RDI training aims to teach children how to think flexibly and engage in social relationships with other people. Typically, RDI training begins by helping children develop relationships with their parents and other family members. It is very similar to other therapies for ASD in that it focuses on the disorderâ&#x20AC;&#x2122;s core deficit -- social skills and interaction. COGNITIVE BEHAVIOUR THERAPY (CBT) Cognitive Behaviour Therapy works to change both cognitions and behaviours that are part of a mental health disorder. CBT does not try to remove the disorder, instead it works the secondary issues related to the experience of life of an autistic person like anxiety, depression, stress, anger, bullying, social skills deficits and limited social support. Since different people have unique cognitive and behavioural habits, thus therapist customize and prepare a tailored CBT plan to meet the strengths and needs of the induvial. Therefore, from the beginning of treatment, therapists explore their goals, passions, and values, then identify specific steps that CBT can help them make in service of that long term goal. ART THERAPY Art therapy is a creative method or technique used for therapy. It is a form of psychotherapy that uses medium of art as its primary mode of communication. For a child with special needs, art can be a mode of expression, it can provide relaxation, help improve focus and give a sense of accomplishment while working creatively. oPost Botox and Operative Treatment. SERVICES PROVIDED AT CONTINUA KIDS Continua Kids is a holistic centre that provides medically supervised therapies, early intervention programs and support for children with special needs. CONTINUA Kids ensures that children with special needs are not hindered from achieving their full potential and get every opportunity to learn and grow, and live a meaningful and satisfied life. They wish to achieve this by providing children with a loving, empathetic and homely learning environment, by empowering their parents through guidance and support in their journey of parenting, and last but not the least, by spreading awareness in society and creating an environment of acceptance, love and equal rights for all. TYPES OF MUSIC INSTRUMENTS USED oBrass Brass instruments are made of brass or some other metal and make sound when air is blown inside. The musician's lips must buzz, as though making a noise against the mouthpiece. Air then vibrates inside the instrument, which produces a sound. Brass instruments include trumpet, trombone, tuba, French horn, cornet, and bugle. oPercussion Most percussion instruments make sounds when they are hit, such as a drum or a tambourine. Others are shaken, such as maracas, and still others may be rubbed, scratched, or whatever else will make the instrument vibrate and thus produce a sound. Percussion instruments include drums, cymbals, triangle, chimes, tam-tam, glockenspiel, timpani, bells, and xylophone. oStrings Yes, the sounds of string instruments come from their strings. The strings may be plucked, as in a guitar or harp; bowed, as with a cello or a violin; or struck, as with a dulcimer. This creates a vibration that causes a unique sound. Stringed instruments include the violin, viola, cello, bass, harp, and dulcimer. oWoodwinds Woodwind instruments produce sound when air (wind) is blown inside. Air might be blown across an edge, as with a flute; between a reed and a surface, as with a clarinet; or between two reeds, as with a bassoon. The sound happens when the air vibrates inside. Woodwind instruments include flute, piccolo, clarinet, recorder, bassoon, and oboe. oKeyboard instruments Conveniently collected together as any instrument which is operated by means of a standard keyboard, the differences in operation are wide-ranging and carry obvious associations with certain of the above categories. These break down into four main types: 1. Plucked mostly instruments emanating from the 17th/18th centuries where a series of stretched and tuned strings are plucked by a quill or plectrum (e.g. harpsichord, virginal, spinet). Struck where the strings are actually hit, either by a tangent (e.g. 17th/18th century clavichord), or hammers (e.g. piano, celesta). Aerated where the notes are activated by a column of mechanically propelled air within a series of tuned pipes (e.g. organ). Electronic where a number of effects approximating to those derived from any of the above instruments, as well as totally original sounds, can be achieved (e.g. electronic organ, synthesizer). OBSERVATIONS IN MUSIC THERAPY oMirroring- When a tone is played by someone and the other copies the tone after it. oMatching- When a tone is played by someone, but the other plays a different tone in continuation. oMusic generates sensation in the body. Music creates rhythm in the body. Different instruments focus on different sensory skills. oInstruments should have a nice grip, something which feels good to touch. oMusic is used to block out all surrounding sounds and disturbances. oA technique known as the Iso Principal is used. It is an approach to interactive music making where the therapist attempts to match the feelings and emotional state of the child. If the child is depresses, sad, then minor keys are played to produce a slow sound. A happy song would not be played to a sad/low person. The idea is to connect spiritually, not evasively. And vice-versa. oSome instruments need special training to be played whereas some instruments just need to be explored and tried to be played. oSoothing sounds of nature brings calmness in the mind and body. oSome Instruments are used to take energy, to let out anger and frustration. SERVICES oIndividual sessions last for about 30 â&#x20AC;&#x201C; 40 minutes while group sessions take about 50 â&#x20AC;&#x201C; 60 minutes. oSessions are conducted once a week unless the child requires or wants more frequent sessions. oEvery session is video recorded for monitoring and assessment purposes. o Assessment is done based on 3-6 month plan with reports given even 3 or 6 months. oPrabal sir explained us about autism and told the various methods of dealing with children with ASD. He explained us about Hyper- and Hyposensitivity in Autism. Hyper vision means that their vision is too acute. They get distracted by the tiniest pieces of fluff on the carpet, dust particles flying’, bright lights and look down most of the time. Individuals with hyper hearing are generally very light sleepers, are frightened by sudden unpredictable sounds (for instance, telephone ringing, baby crying); they dislike thunderstorm, crowds. They often cover their ears when the noise is distracting . Sometimes they make repetitive noises to block out other disturbing sounds. Children with olfactory hypersensitivities cannot tolerate how people or objects smell. They run from smells, move away from people and insist on wearing the same clothes all the time. Some dislike food smell and they reject it no matter how hungry they are. They are usually poor eaters, gag/vomit easily and eat only certain foods. Children who are hyper tactile pull away when people try to hug them, because they fear being touched. Even the slightest touch can send them into a panic attack. Washing hair or cutting nails turns into an ordeal. Many individuals refuse to wear certain clothes, as they cannot tolerate the texture on their skin. Some children with hyper tactility overreact to heat/cold, avoid wearing shoes, avoid getting ‘messy’ and dislike food of certain texture. Children with vestibular hypersensitivity experience difficulty changing directions and walking or crawling on uneven or unstable surfaces. They are poor at sports. They feel disoriented after spinning, jumping or running and often express fear and anxiety of having their feet leave the ground. Individuals with proprioceptive hypersensitivity hold their bodies in odd positions, and might have difficulty manipulating small objects. HYPO-SENSITIVITY Sometimes the senses of autistic children are in ‘hypo’, so that they do not really see, hear or feel anything. To stimulate their senses they might wave their hands around or rock forth and back or make strange noises. oChildren with hypo vision may experience trouble finding out where objects are, as they see just outlines, then they may walk around objects running their hand around the edges so they can identify what it is. These individuals are attracted to lights, they may stare at the sun or a bright light bulb. They are fascinated with reflections and bright coloured objects. Having entered an unfamiliar room they have to walk around it touching everything before they settle down. Often they sit for hours moving fingers or objects in front of the eyes. oChildren with hypo hearing may ‘seek sounds’ (hearing electric equipments or enjoying crowds, sirens and so on). They like kitchens and bathrooms since they are the noisiest in the house. They often create sounds themselves to activate their hearing – banging doors, tapping things, tearing or crumpling paper in the hand, making loud rhythmic sounds. oIndividuals with hypo taste/hypo smell chew and smell everything in their reach(e.g. grass, play dough). They licks objects, play with them and try to put everything in their mouth to get its taste. oThose with hypo tactility may not be able to feel pain or temperature. They may not feel a wound caused by a sharp object or they seem unaware of a broken bone. They are prone to self-injuries and may bite their hand or bang their head against the wall. They like pressure, tight clothes, often crawl under heavy objects, hug tightly and enjoy rough play. oChildren with vestibular hyposensitivity enjoy all sorts of movement and can spin or swing for a long time without being dizzy. People with vestibular hyposensitivity often rock back and forth or move in circles while rocking their body. oThose with proprioceptive hyposensitivity are often unconscious of their own body sensations, for example, they do not feel hunger. Children with hypo proprioceptive system seem floppy, often lean against people and objects. They bump into objects and people, trip frequently and have a tendency to fall. They have a weak grasping power and drop things frequently. THEORY OF MIND (TDM) oAccording to Prabal Sir, Autistic children have an ability to self imagine every situation, which is a part of THEORY OF MIND. Theory of Mind mentions that many autistic people do not understand other people’s thinking and point of view. They have a difficulty in understanding other people’s beliefs, attitudes and emotions. oSince the autistic individuals are not able to comprehend other people’s thoughts, they face problems relating to socially connecting to people and communicating with them. They may not be able to apprehend what others will say or do in various occasions. Furthermore, they may have difficulty in understanding their peers or friends and thus may appear to be selfcentred, peculiar or uncaring. MEANS OF TEACHING Prabal sir uses mainly two methods of cognitive teaching: oPECS: Picture Exchange Communication System- PECS is built on the idea that children who can't talk or write can be taught to communicate using pictures. In PECS, he draws or shows a picture to the child and tells the child to recognise and say it or match it with the written word. This helps the child to connect with the object and associate with daily life. oThe Six Phases of the Picture Exchange Communication System Are: 1. How to Communicate: Autistic child learns to exchange single pictures for items or activities they really want. Distance and Persistence: Using single pictures, the autistic child learns to generalize this new skill by using it in different places, with different people and across distances. They are also told to be more persistent communicators. Picture Discrimination: The autistic child learns to select from two or more pictures to choose their favourite things. These are placed in a basket, a copy with Velcro strips where pictures are stored and easily removed for communication. Sentence Structure: The autistic child learns to construct simple sentences on a detachable sentence strip using an "I want" picture followed by a picture of the item being requested. Answering questions: The autistic child learns to answer â&#x20AC;&#x153;What do you wantâ&#x20AC;? by pointing at a picture. Commenting: The autistic child is taught to comment in response to questions. oPicture books oStory telling: Prabal sir narrates social stories with less content and more visuals keeping a positive impact on children to emphasise on good behaviour. The stories target on good behaviour so that the children self realise the things that should be done and that should not be done. On meeting Dr. Alam, he informed us about Autism spectrum Disorder (ASD) which is an umbrella term of the following: oAutism oRett Syndrome oAsperger syndrome oChildhood Disintegrative Disorder oPDD-NOS (Pervasive Developmental Disorder Otherwise Specified) used to describe atypical autism. These five conditions include problems in using and understanding language, difficulty relating to people, difficulty with changes in routine, repetitive body movements and unusual play skills. RETT SYNDROME Rett syndrome is a rare, severe neurological disorder that affects mostly girls. It's usually discovered in the first two years of life. Although there's no cure, early identification and treatment may help girls and families who are affected by Rett syndrome. It is mostly genetically based. Symptoms of Rett syndrome: oSlowed growth: The brain doesnâ&#x20AC;&#x2122;t grow properly, and the head is usually remains small (this is known as microcephaly). This growth becomes clearer as the child gets older. oUnregulated hand movements: Most children with Rett syndrome do not have control on the use of their hands. They tend to twist or rub their hands together. oNo language skills: Between ages 1 to 4, social and language skills start to decline. Children stop talking and can start having extreme social anxiety. They may maintain distance from or not be interested in other people, toys, and their surroundings. oProblems with muscles and coordination: This may make walking problematic. oTrouble with breathing: A child with Rett may have uncoordinated breathing and seizures, including very fast breathing (hyperventilation), forceful exhaling of air or saliva, and swallowing air. Children with Rett syndrome also tend to become tense and irritable as they get older. They may cry or scream for long periods of time, or have long fits of laughter. CHILDHOOD DISINTEGRATIVE DISORDER Childhood disintegrative disorder (CDD), or Heller's syndrome, is a rare prevalent developmental disorder (PDD) which involves relapse of developmental ability in language, social function and motor skills. CDD is considered a low-functioning form of ASD. However, autism does not show the severe relapse after several years of normal development whereas children with CDD show a more dramatic loss of skills compared with children with autism. CDD also tends to develop later than autism, and can develop very much later (up to the age of 10 years). TIMELINE OF UDAAN o1992 : Birth of UDAAN o1994 : Registered as Non profit trust ; Foundation for Spastic and mentally Handicapped Persons. o2000 : Recognized by Ministry of social justice, Govt of India as a project for education and training of severely multiple handicapped children. o2001 : Pioneered introduction of HBOT in brain damaged children o2006 : Initiated Biochemical testing for Children with Autism and need based dietary and micro nutrient support. o2006 : Introduced low pressure hyperbaric therapy in India to treat children with brain damage. o2007 : Organized NR2CON, an international conference covering all aspects of neurodevelopmental disabilities, attended by more than 600 delegates and presented by 7 international authorities and almost 20 national authorities as speakers. o2007 : Initiated mild HBO for children with autism o2010 : Dr. Mukherjee was awarded Hyperbaric Doctor of the year at the 7th International symposium on HBOT, California. o2012 : First Indian Doctor to complete 1st & 2nd training module of Medical Academy of Paediatric Special needs from U.S.A.
o2013 : Initiated Autism Hour, a free monthly internet based interactive conference on one important topic on Autism, conducted by a world authority, with Dr. Mukherjee on the Specialist Panel as one of the coordinators. o2013 : MB12 double blind randomized controlled clinical trial in autism affected children initiated. On this day we had to observe the children and get involved in other activities and games with the children. The observations made on the day were: We were told to help Vivan and Suhani in embroidery. We had to make designs on the cloth and then they were doing embroidery on the lines. Both of them were following the instructions quite well and they made beautiful designs. But in short intervals of time, they got distracted or bored and wanted to do something else. In frustration, they sometimes pulled the thread quite tightly in order to break the thread or started biting their hands or knuckles. It was also observed that all children communicate differently. Some answered questions by saying words but not very clearly, some used sign language or some answered by drawing or writing different options and asking them to choose the right answers. On asking both of them about their favourite colours, they told that it was Red and Pink respectively. During the craft class where children were given the activity of envelope making by cutting and pasting, it was noticed that some enjoyed it whereas some found it very boring. Motor skills were also not the same for all, some had an excellent grip of the scissors and were cutting along the line and vice versa. During pasting the sheets, some had problem in sticking the sheet due to stomping whereas some stamped the sheets very hard making the sheets tear. The time duration for each class is fixed and the children have to change classes for each activity. Since all of them are of different levels of autism, some needed help in changing classes whereas some are very independent. On the 3rd day we were the children from 9 am to 2 pm. We were told that they had Yoga classes on Tuesdays and Fridays. So we went at 9am to be part of their yoga classes. They were assessed by the teachers during yoga classes. Some of them enjoyed whereas some of them had problems in doing the asanas or staying focused. On that day they had other classes like Circle Time, Attendance, Signature and teaching Date, Month, Year. On the third day we spent time with the small children and sat in their class with them. We interacted with Swastik (naughty and talkative yet clever), Mayank, Shikhar (destructive, uninterested, laughs, slams door), Pashu(4 years old with cerebral palsy, doesn’t say anything, claps when acted to her) Aneesh and Sarthak. We celebrated Anuradha Ma’am’s birthday by cutting a cake and distributing sandwiches and drinks to all children and we also had. oKept a party for all the children and took edibles for them like Samosas, Frooti tetra packs, Chocolates and chips packets. oUnderstands and knows how to identify date, time and year oCan pronounce a word after hearing it oRepeats words when not needed oWhile counting he gets confused and needs help oUses Phonetics while talking or reading. NOISE SENSITIVITY IN AUTISM oHyperacusis is an increased sensitivity to sound that is found among autistic people. This means that certain noises may be uncomfortable for your child to hear. When a sound is distressing to a child, he or she may show discomfort by covering their ears, trying to turn off the source of the sound or leaving the noisy environment. oAccording to a survey, The children with autism rated sounds that were above 40 decibels as being significantly louder than the children in the other group. For reference, a normal conversation is about 50 decibels and a â&#x20AC;&#x153;library voiceâ&#x20AC;? whisper is around 30 decibels. This suggested that children with autism may have a reduced range of comfortable volume, meaning that sounds start being uncomfortable at a lower volume than for other children. So, it may be that children on the autism spectrum actually perceive noise to be louder than their peers. STRATEGIES TO HELP HYPERACUSIS oIdentify Irritants Perhaps the most important step is to identify which sounds are uncomfortable for your child. Examples may include the radio or school bell, a vacuum or the dishwasher. When your child indicates distress at the onset of a sound, make note of the cause. Also, talking to an audiologist can help you identify the type of sound sensitivities your child may have. oCreate Quiet Time Audiologists and speech-language pathologists discourage the overuse of earplugs and headphones to avoid noise sensitivities. However, it is acknowledged that noise cancelling headphones may provide relief if a child becomes exceptionally distressed and overstimulated. Noise breaks may also be helpful (for example, going to the noisy grocery store followed by a quiet activity). oIdentify Quiet Zones Write down the places that are naturally quiet and comfortable for your child. This could be a library, art class, a church group or going for a walk. oCreate distractions When trigger noises are unavoidable, a distraction may help your child manage the invasive sound. A favourite toy, an iPad, puzzle or special bottle of bubbles may redirect your childâ&#x20AC;&#x2122;s attention from the distressing noise to the novelty of his or her new activity. oObserve First Before exposure to a potentially uncomfortable noise, allow your child to listen to the noise from afar. Using multiple opportunities to familiarize your child to the sound will help reduce the shock of a long exposure to a sound. oCreate Control Adjusting to certain sounds may be aided by allowing your child to feel in control of the sound. In example, if the vacuum is an unpleasant noise maker, allow your child to turn the vacuum on and off. Similarly, allowing your child to ring bells, start the dishwasher or honk the car horn may help ease his or her aversion through gradual exposure at his or her own will. OBSERVATION On observing a child during her speech therapy, it was found that she was uncomfortable with loud sounds. The therapist advised her parents to take her often to movie theatres and make her listen to music on a surround sound system to make her used to the high volumes. REMODIFIED DESIGN BRIEF To design an inclusive game/activity/product for Children, specially with the symptoms of Autism Spectrum Disorder to enhance their skills and make them sustainable in the environment. TARGET AUDIENCE oChildren, specially with Autism within the age group of 5-10 as children of this age group are limited to think concretelyin tangible, definite, exact and uni-directional terms based on real and concrete experiences rather than on abstractions. oDuring this age group, children analyse their environment using mental symbols. These symbols often include words and images and the child will apply these various symbols in their everyday lives as they come across different objects, events and situations. oThroughout this age group, children use appropriate logic to develop cognitive operations and apply the new thinking to different events they may encounter. Children in this age group incorporate inductive reasoning, which involves drawing conclusions from other observations in order to make a generalization. DESIGN INSIGHTS Any product designed for an autistic child should have these features taking in consideration a normal kid also: o Easy to use, yet challenging: If a child has a problem in operating the game then it would be a fail, although it could have some level of complexities that challenge the mind of the child. oRepetitive: Game needs to have a repetitive set of actions that leads towards the goal. Since the children with ASD tend to relax after they see or do something again and again, repetition can help them in calming down. oEducational and Message giving: Game needs to deliver some message such that in the end the child learns something and can apply it in real world. It should have connections with the things related to his daily life or surroundings. oSocial Aspect: The game can involve two or more children or playing under the supervision of an elder that could help them know each other and connect socially. It could also be a single player game as well because children with ASD might not like to do so. oPictorial: The primary requirement of any board game designed for ASD would need to have pictures. Because these children are usually not vocal and they could easily relate through means of drawing or sketching, so the game needs to be pictorial. oMultiple levels: Game needs to have complexities in ascending order from 7-12 years. oSense of Achievement: In the end like regular games, it should give the child a sense of achievement which would invite him to play the game again. GAMEPLAY This game will consist of a box with 4 openings on the top. The board on top and the box underneath will be divided into 4 compartments based on the four seasons: Rainy, Summer, Winter and Autumn. The corresponding compartment of the season will consist of objects related to the season. The child has to go to the box, spin the spinner and whichever season it points to, the child will put his hand inside the hole on the top of the box and take out an object and show it to everyone and guess it. GAMEPLAY This game comprises of a wooden picture board with grooves of shapes in it. There will be other pieces of the same shapes to fit into it which would be of the actual material to give the child a good tactile experience. The pictures would be of everyday scenes which the child can relate to. The materials would be daily materials from the environment. The child will have to pick up the piece, feel its material and texture and figure out where would it be fixed. GAMEPLAY oThis game includes a board with boxes cut out from it which follow a path. All the boxes are allotted points but the boxes that fall in the path lead to the box with the maximum point which can make the child win. The boxes where all the ball passes will lit up so that the child knows which point he attained. oThe child has to aim the direction of the ball and strike it though a bow and arrow striker. GAMEPLAY oThis activity board aims at teaching the child how to lock and unlock, close and open different kinds of buttons and locks which are found in everyday objects. This is to make the child independent so that he does not need help of others to do these day to day activities. oIn this board, there are different everyday items in which different kinds of buttons and locks are found. The child has to identify the object and figure out which locking mechanism is used there and open and close it. GAMEPLAY oA texture carpet to enhance the tactility experience of the child. The carpet is divided into a grid, each box having a different texture of material. GAMEPLAY oA mechanical table in which two objects pop up randomly electronically. The faculty will ask to recognise a particular object. Identification of everyday objects 2. GAMEPLAY This is a currency exchange game where the child has to exchange money to buy everyday items. BENEFITS OF THE GAME 1. GAMEPLAY This is a game in which the child has to throw the respective coloured rings into the rods. The rings would be tambourine rings that create sound on reaching. Each ring will have different number of bells to produce different intensities of sound. BENEFITS OF THE GAME 1. Improves focus and aiming 2. 3. GAMEPLAY oThis is a musical wrestling bag for the children to bang in agitation. It will have a layer of skin on the outing. There would be cushioning for avoiding harm to the child. The wrestling bag would have different amount of bells inside to give different sounds at different levels. BENEFITS OF THE GAME 1. FEATURES OF THE PRODUCT oThis is a tool for children who engage in sewing, stitching and embroidery. Instead of the circular rings, which cause a big problem to autistic children, this mechanism can be attached on the table. The cloth can be attached on the mechanism for the embroidery to take place. The length can be adjustable since the mechanism has telescopic structures. BENEFITS OF THE PRODUCT 1. Reduces the confusion caused by embroidery in ring 2. GAMEPLAY oThis table has several compartments which can be interchanged. The top tray would have grooves in a maze form to move the token. The boxes will have pictures of animal which the child will have to match with the animal token. The child has to find his way to the animalâ&#x20AC;&#x2122;s home. The tokens would be 3D animals. oWhen the child matches the animal to itâ&#x20AC;&#x2122;s house, there will be a sound of the animal as a form of appreciation to help their sound sensitivity. BENEFIT OF THE GAME 1. Child will learn about everyday animals and their surroundings 3. Form of appreciation in the means of their sound. It will also help them in getting used to sound of animals found in the surroundings. oPlaying. The child selects an animal which is parked on the side of the maze. The child is tasked to take the animal to its house/ food through the maze. Eg. Make the dog reach the kennel/ bone from the sides where it is kept initially. There will be 10 animal tokens and 10 picture cards. There are only 5 slots on the board for the picture card, hence they can be interchanged. oSound. When the animal reaches its right destination, its home or its food, then a sound is created of the animal to show that it has reached the correct place. The sound of the animal is not created at any other point. Since this game will be played under the supervision of an adult like the parent or teacher for giving the instruction, it will augment the relationship between the child and the parent/teacher. Since children usually match visual things well, this game allows them to match the objects visually as well and achieve the task. GAMEPLAY oWhen the child sits to play the game with the parent/ teacher, the adult instructs the child to match the animal with itâ&#x20AC;&#x2122;s house or food. For example, the parent may instruct the child to take the cat to the cattery or make the cat drink milk. oThe child will find the token of the animal from the all the animals parked on the side and glide its way through the maze to reach its destination. For example, the child will find the token of the cat from all the tokens parked in the side, and then slide the token throughout the maze to find the cattery/milk. oThe child may visually try to match the animal with its habitat/food. oAfter many trials and tribulations, when the child reaches the destination, there will be the sound of the animal to indicate achievement of task. When the animal token reaches its destination, there is a sound produced of the animal to indicate that the task has been achieved. Cards are removeable. They are visual representations of the habitat/food of the animal. By looking at the pictures, the child can match the animal. It proves as a motivation for children. It helps in noise sensitivity in children specially with autism. The children become acquainted of the sounds of animals in their surroundings. The animal tokens would be made of melted plastic through plastic moulding. This has 2 layers of mount board which have been laser cut. 2 layers have been made to give an elevation in the upper layer. The lower layer is 2mm less on all sides than the upper layer for the token to fix and glide through without coming out. In this prototype the upper layer has been elevated by cutting small pieces of mount board and stuck between the base and the upper layer that has been laser cut. There will be space between the base and the upper layer for the token to fix and glide through without coming out. This game board is made in MDF and the grooves have been created through a milling machine. ARDUINO The Arduino has been programmed in such a way that the token for each animal is customized and is not interchangeable. Eg. The roar of a tiger will come when it will reach itâ&#x20AC;&#x2122;s den/meat. The roar will not be sounded when it touches the home/food of any other animal. HOW IS THE GAME HELPFUL The game will help the child develop his motor skills as he will be able to learn to control his hand movements by moving the animal counters in a definite direction/path. The game will also increase their power of memorizing things related to everyday animals that they see in their surroundings. Since the child may try to figure out the habitat/food of the animal by visually identifying the picture, it boosts their matching abilities. The sound effect would make them get used to the actual sound of the animals that they might hear on a regular basis and may find it uncomfortable. The game will thus help them in their sound sensitivity. BENEFITS OF Gaze-O-Maze ENHANCING COGNITIVE SKILLS: Since the child may try to figure out the habitat/food of the animal by visually identifying the picture, it boosts their matching abilities. This helps the child to connect with the object and associate with it in their daily surroundings. FINE MOTOR SKILLS: The game will help to develop their motor skills as he/she will be able to learn to control his/her hand movements by moving the animal token in a definite path/ direction. Holding the animal token and not being able to pull it out will improve their grip. The game ensures that a child constantly improves on his hand and eye coordination as they have to keep track of the path to reach their destination. ENHANCING CONCENTRATION/ ATTENTION LEVEL: While doing any task, a child needs to be attentive and autistic children need some kind of motivation to move ahead. The animal sounds which are made when they reach the goal, acts as a re-enforcement and motivates them to move to the next task. Since the child has to wait and listen for the animal sound in the midst of surrounding sounds, they need to concentrate for identifying the sound. ENHANCING MEMORY/ LEARNING SKILLS: The game will also increase their power of memorizing things related to everyday animals that they see in their surroundings. By looking at the picture and hearing the sound of the animal in the game, they can memorize it and identify the animals in their real life. They can read the names of the animals, their home and food on the picture cards and memorize the spellings. HOW IS THE GAME INCLUSIVE The game is designed for children of age group 5-10 and specially helpful for the children with autism. The game strengthens the motor skills of a child, enhances their knowledge, improves their speech and makes them aware of the sounds, habitat and food of animals in their day-to-day surroundings. The game can be played with the entire family which helps in bonding, communication and interpersonal relationships. Since this game is designed for all children, but fulfils the needs of children specially with autism, it is an inclusive design. Cost of Production would be 15% of the Cost of Prototyping in a scale of producing 100 items. Thus, the cost of 1 piece would be ₹900. Hence, producing 100 pieces would cost ₹90,000 in MDF using milling process.